Death Proof is the ultimate Tarantino movie which is full of action, cliché and bad acting in this modern "B-Movie" that pays homage to the 1970's of the schlock horror/action genre. The film removes around Stuntman Mike (Kurt Russell) who stalks beautiful women with his deadly vintage car but when he chooses the wrong trio of girls (Rosario Dawson, Tracie Thoms, and Zoe Bell), it becomes a powerful struggle and a reversal of cat and mouse. Like most Tarantino films, there are plenty of nods to pop culture and it's entertaining to see modern cars and mobile phones in this movie as it feels like it has come directly from the 1970's with its grainy film quality. Although most of the scenes are deliberately short on plot development, the dialogue comes thick and fast throughout and the film stock is often cleverly manipulated to perfectly replicate the B-movie aesthetic. Even though this is not Tarantino's greatest Hollywood film, Death Proof is an entertaining tale that will have you glued to the screen and Russell's performance is definitely worth the ride from start to finish, especially the ending where he begins to whimper like a baby. Obviously this is what happens Tarantino is allowed off the leash and all I can say is bring it on! On Blu-ray, Death Proof is an amazing movie with exceptionally sharp images, even though it has a "vintage" feel to the way it is presented that just makes the experience so more enjoyable. Match that with the great sound track and brilliant use of the surround sound system thanks to Dolby and Death Proof is one disc that we could recommend to all fans of Tarantino or B-grade action movies. 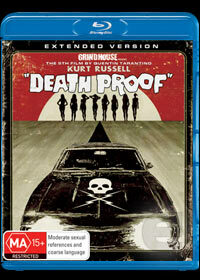 Add in a variety of special features and you are in Death Proof heaven that may become the cult classic that it has been based on.